The first quarter finals of the Champions League were played on Tuesday and Wednesday of this week, and they brought us both games with many goals, as well as, goalless. 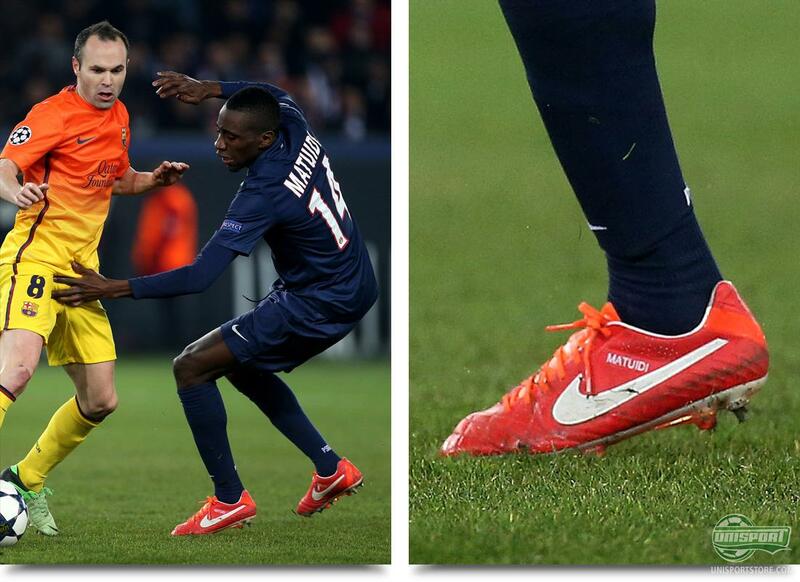 We have, as always, been on the lookout and spotted a boot or two from the midweek games. 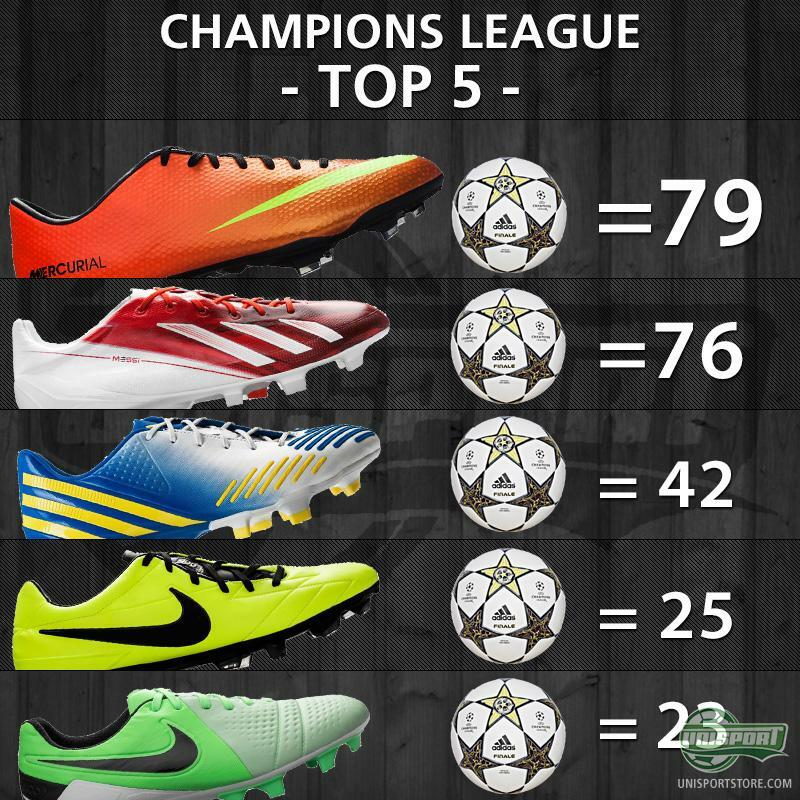 On top of that, we have also updated our top 5 of the most goalscoring boots in the tournament. So, come along, and let's get on with it. We had the pleasure of four games from the absolute top drawer during this first week of April, and the entertainment level went all the way from top level to rock bottom across the games. 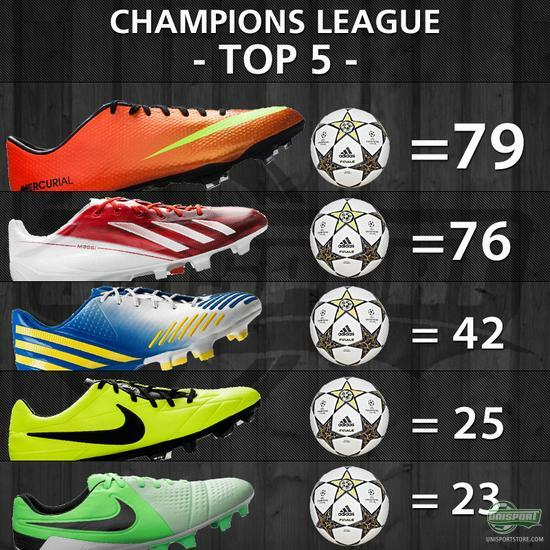 None the less, a good number of goals were scored, which resulted in our top 5 of the most scoring boots in the Champions League to look like this. Vapor and Adizero are flying, but which one will take the top spot in the end is still hard to tell. 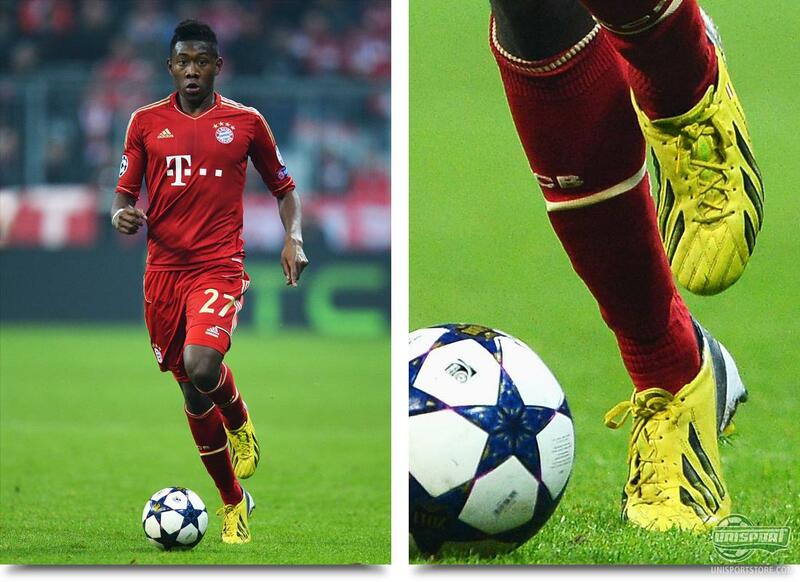 David alaba (Bayern München)  Adidas F50 Adizero Yellow/Black One of the fastest goals ever to be scored in the history of the Champions League was scored by the young left back, who needed less than one minuted to find the back of the net. Alaba took the chance from outside of the penalty area and with his Adidas F50 Adizero Yellow/Black plus a slight deflection, he managed to get the ball past the experienced Buffon, and then Bayern München were one up. Thomas Müller (Bayern München)  Adidas Predator LZ Yellow/Purple/Black Allianz Arena is not an easy place to come and Bayern had just won a game 9-2 on the very same pitch. They continued the impressive play and in the second half, Thomas Müller effectively closed the game, when Buffon, once again, did not have one of his best moments. 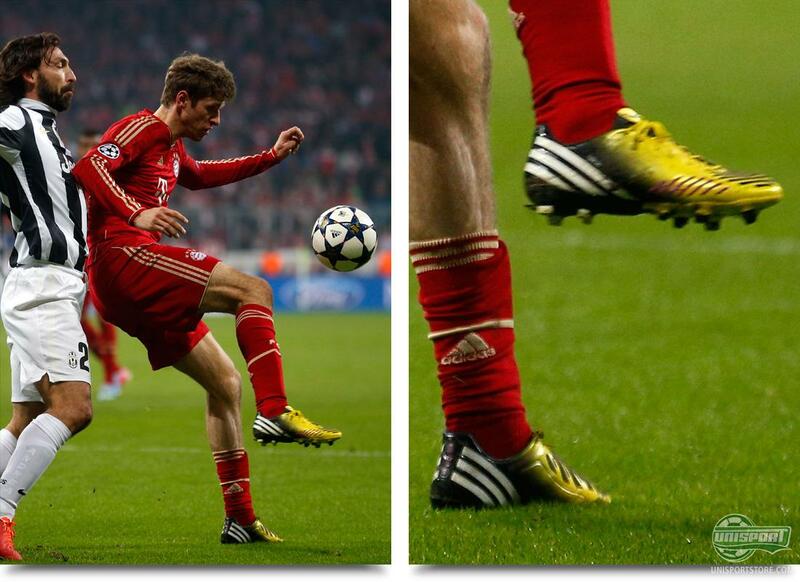 The German finalised the game at 2-0 in his Adidas Predator LZ Yellow/Purple/Black. Lionel Messi (Barcelona)  Adidas F50 Adizero Messi Red/White Tuesday's second quarter final was a clash between Barcelona and PSG in Parc des Princes, and Messi 'the magician' was on it again. 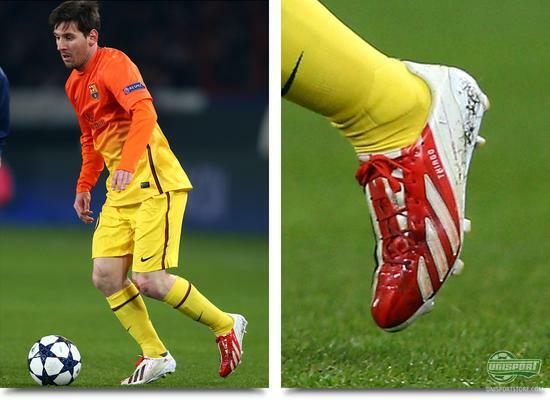 Although the French kept a close eye on the Argentinian, he still managed to make it 1-0 in his Adidas F50 Adizero Messi Red/White; which he has had customised with a leather upper, unlike the regular synthetic upper. 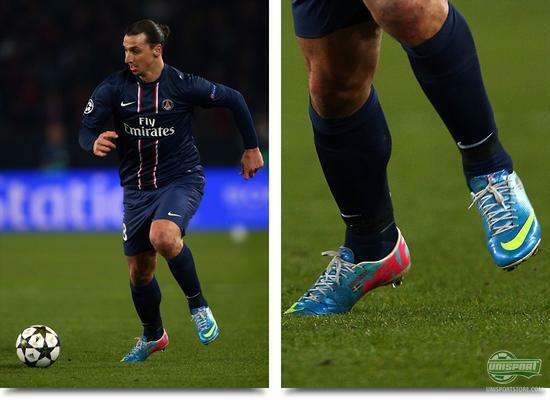 Zlatan Ibrahimovic (PSG)  Nike Mercurial Vapor IX ACC Neptune Blue/Volt-Tide Pool Blue The Swede was up against his former club, and it was pretty obvious that he was looking for revenge after his rather unpleasant exit from Barcelona. Surely he enjoyed tying things up with his equaliser, although he looked to be in an offside position. Anyhow, goals are what counts, and therefore the goal from his Vapor IX ACC Neptune Blue/Volt-Tide Pool Blue also counts in our top 5. 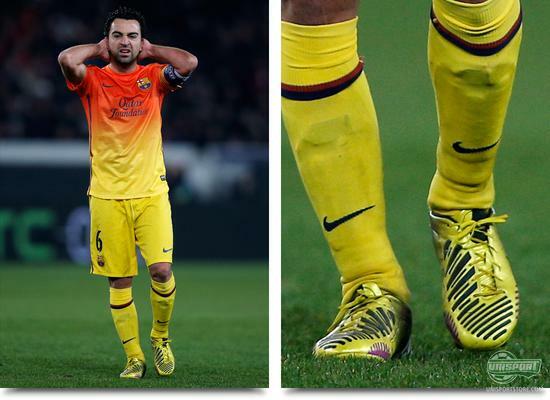 Xavi Hernandez (Barcelona)  Adidas Predator LZ Yellow/Purple/Black The game was almost coming to an end as Barcelona got a penalty kick, and with Messi out with an injury, Xavi stepped up to the spot. He put the ball into the back of the net, like it was the easiest thing in the world with his Adidas Predator LZ Yellow/Purple/Black, and then the Catalans just had to stand their ground for the last minutes. Blaise Matuidi (PSG)  Nike Tiempo Legend IV ACC Sunburst/White/Total Crimson The leading team of La Liga have had some serious defensive issues this season, which was also displayed as PSG's midfield machine, Blaise Matuidi, managed to score in the dying seconds of the match. A top strike from his Nike Tiempo legend IV ACC Sunburst/White/Total Crimson got the better of Victor Valdes, who looked less than impressive in the situation, although he had played a fine match in general. 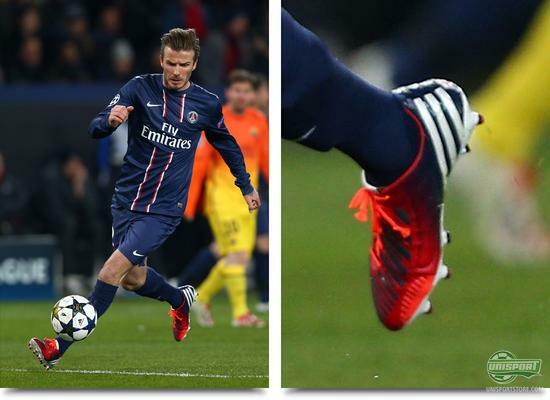 David Beckham (PSG)  Adidas Predator LZ Custom Red/Navy Quite a few people were surprised to see David Beckham in the starting eleven, ahead of Marco Veratti, and Beckham was ready to take the chance. Becks, who is the last remaining Englishman in the Champions League, made his comeback to his favourite tournament in his customised Adidas Predator LZ Red/Navy, which are designed by his son to match the PSG kit. 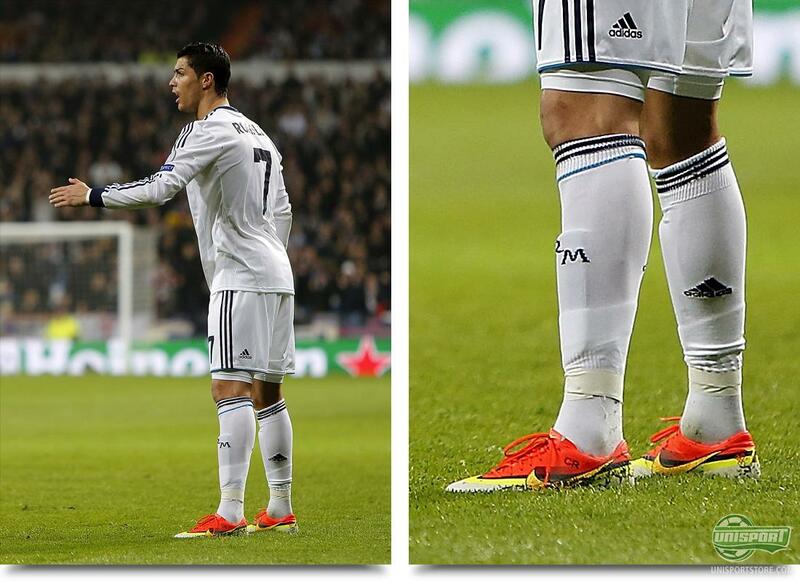 Cristiano Ronaldo (Real Madrid)  Nike Mercurial Vapor IX ACC CR7 So far the Portuguese has given his new boots a pretty good start and he has actually netted in every game where he has been wearing them. In ice cold fashion, he put the ball behind Galatasaray's Muslera, and he did so wearing his exclusive Nike Mercurial Vapor IX CR7. Karim Benzema (Real Madrid)  Adidas F50 Adizero Custom Blue/Purple/White It was a confident Spanish team who welcomed Sneijder and Drogba, and I didn't take long before they could make it 2-0 in their favour. This time, Karim Benzema and his Adidas F50 Adizero Blue/Purple/White, found the back of the net. 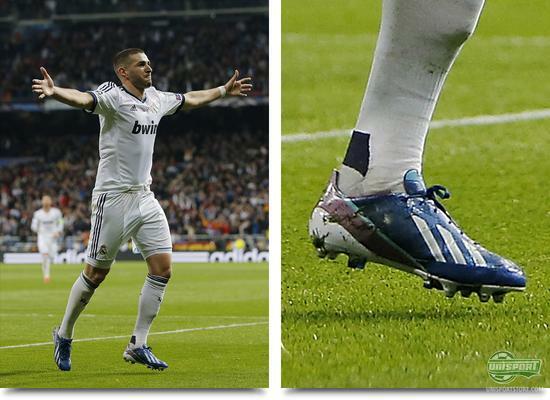 If we take a closer look at the sole of Benzema's boot, we can see that he doesn't have miCoach in his Sprintframe, similar to Bale and Menez. 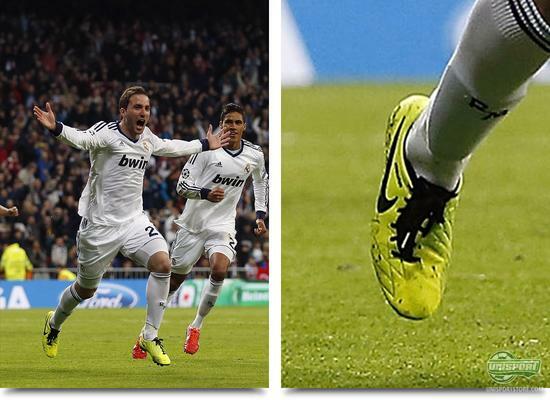 Gonzalo Higuain (Real Madrid)  Nike T90 Laser IV ACC Volt/Black/Citron During last season, this Argentinian, was the most efficient player in La Liga as he, on average, needed no more than 55 minutes to score a goal; 20 minutes less than Ronaldo and Messi. Higuain, once again, showed his efficiency as he was brought on in the second half and quickly found the goal with a header to make it 3-0. The goal will still count in our top 5 with his Nike T90 Laser IV ACC Volt/Black/Citron. Albert Riera (Galatasaray)  Adidas F50 Adizero Whiteout The Turks started the game very well, but they had some difficulty keeping up for the full 90 minutes. One of their players who didn't stay on the pitch for the entire game was Albert Riera, who has previously played for Liverpool; anyhow, he had chosen to sport a top classy boot. He had picked a pair of whiteouted Adidas F50 Adizero, something that we applaud very much, as it looks absolutely class. Jeremy Toulalan (Malaga)  Adidas Copa Mundial Black/White Wednesdays second quarter final stood between the débutantes from Malaga and the German champions from Dortmund. The match resulted in a goalless split of the points, but we still managed to spot something of top quality on the feet of French Toulalan. He had picked the true retro classic Adidas Copa Mundial, and it is true joy for us to spot this classic boot on such a high level. Javier Saviola (Malaga)  Adidas Adipure 11pro Whiteout He might have had his days of glory with Barcelona, but nowadays Saviola applies his trade in Malaga. He surely manages to show that he still has got great taste when it comes to football boots, as he wore a pair of whiteouted Adidas Adipure 11Pro, which may be counted as one of the most elegant colourways of 2012. This weeks Champions League brought us loads of goals, loads of boots and a couple of shaky goalkeepers, but we would love to hear what you will remember from the four quarter finals? Which goal was the best? Let us know in the box down below.